NEW YORK Coca-Cola (KO) is taking bottled water and doing what it does best - giving it some bubbles and flavor. 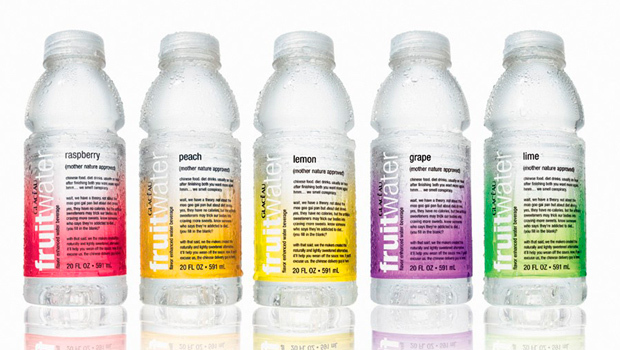 The Atlanta-based company confirmed Monday that it would introduce a line of zero-calorie, carbonated, fruit-flavored waters called "fruitwater" starting April 1. The drink will be part of Coca-Cola's Glaceau unit, which makes other pricier bottled waters such as vitaminwater and smartwater. Unlike the zero-calorie version of vitaminwater, which is made with the natural sweetener stevia, fruitwater will be sweetened with the artificial sweetener sucralose, best known as Splenda. It will not contain any fruit juice but the bottle notes that the drink is "enhanced with nutrients," a reference to its B vitamins, magnesium and zinc. Greek yogurt popular with adults but will it save Greece? The rollout was first reported by the trade journal Beverage Digest. Such an "unsoda," fizzy and sweetened but packaged like bottled water, could lure people who are looking for an alternative to sugary carbonated drinks. Soft drink consumption has slid in the U.S. since the late 1990s. The decline has been attributed to growing concerns about obesity, as well as the proliferation of options such bottled teas and flavored waters. Industry executives have nevertheless expressed optimism about sparking a turnaround in the soft drink category with better-tasting, lower-calorie options, noting that Americans love fizzy drinks. Still, Coca-Cola has diversified its portfolio as drinking habits change. In 2007, it paid $4.1 billion for Glaceau, which was then its largest ever acquisition. Executives noted at the time that the price would be worth it for the rapidly growing brand. Overall sales volume for Glaceau rose 4 percent last year, according to Beverage Digest. Zero-calorie varieties have performed far more strongly, suggesting people are increasingly watching how much sugar they drink. vitaminwater with zero calories was up almost 4 percent, and smartwater, which is marketed as a premium plain water, was up 25 percent. Regular vitaminwater - which has about 125 calories in a 16-ounce bottle because it is sweetened with sugar - was down 8 percent. Though Coca-Cola also owns Dasani bottled water, premium bottled waters that promise health benefits or added flavors are generally more profitable because they can fetch higher prices. But the marketing for vitaminwater has resulted in some trouble for Coca-Cola as well, with a nutrition advocacy group suing the company over what it called "deceptive" health claims that the drinks can reduce the risk of disease. A representative for the Center for Science in the Public Interest said it's still awaiting a judge's ruling on a motion seeking class-action status for the lawsuit. A spokeswoman for Coca-Cola, Lindsey Raivich, said fruitwater will come in a specially contoured 16.9-ounce bottle. It will cost $1 to $1.25 and come in black raspberry, orange mango, strawberry kiwi, lemon lime and watermelon punch. Raivich said the company is planning a formal announcement closer to the launch date. Though no TV ads are planned, she said the marketing campaign including radio, print and in-store promotions.